As one of the most versatile and practical construction materials in use today, glass offers seemingly unlimited design opportunities to architects and specifiers for all types of building projects. The inherent strength, low-maintenance and light transmitting characteristics of clear glass make it a popular choice for elegant external and internal balustrading applications. Whether for newbuild or refurbishment schemes, glass adds that touch of class to turn an important security feature into something special. Glass balconies offer many advantages over alternative materials, such as timber or steel. Achieving clean lines with minimal use of support posts, the beautiful aesthetics of a glass balustrade instantly elevate a building’s appearance above the ordinary. The purpose of a balustrade or railing is to provide edge protection where a fall can occur. This applies to a balcony, terrace, staircase or landing – indeed anywhere where there is a fall of more than 600mm (60cm or approximately 23.5 inches). The railing or balustrade must be sturdy enough to resist pressure applied to it and not fail, fall over, bend or distort in shape. The pressure that is applied to the balustrade or railing is called a ‘load’ or ‘loading’. Common methods of taking this load require either posted systems or the use of structural glass. The Balcony Systems’ balustrade is a type of hybrid system that combines these two types of support in one. This unique approach offers tremendous flexibility and plenty of creative scope for design to suit even the most individual requirements. 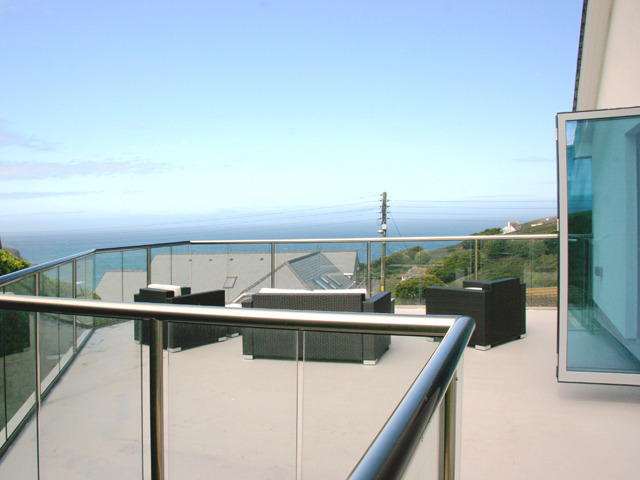 Depending on the specification, the balustrade can combine the strength of the handrail, glass and when needed, posts. There is no other system on the market that can achieve this. For sharply-angled balustrades, glass-to-glass corners provide the required strength for safety with the added benefit of pleasing aesthetics. Straight and curved glass panels can be combined for visual impact, allowing for flowing lines to follow the contours of buildings or terraces. This combination was used to stunning effect surrounding three sides of a Cheshire bungalow. A total of 39 metres of curved and straight glass balustrading with a shiny Royal Chrome handrail finish supplies the necessary safety, while keeping the views to a nearby canal. Nine metres of curved panels follow the lines of a semi-circular patio area within the extensive brick and granite terrace that provides level leisure areas above the sloping garden. The low-maintenance benefits were further enhanced with an innovative self-cleaning glass coating, which creates a smooth surface on both sides of the glass that quickly repels water, dirt and grime to keep the glass cleaner for longer. This reduces cleaning cycles without the need to use chemicals. 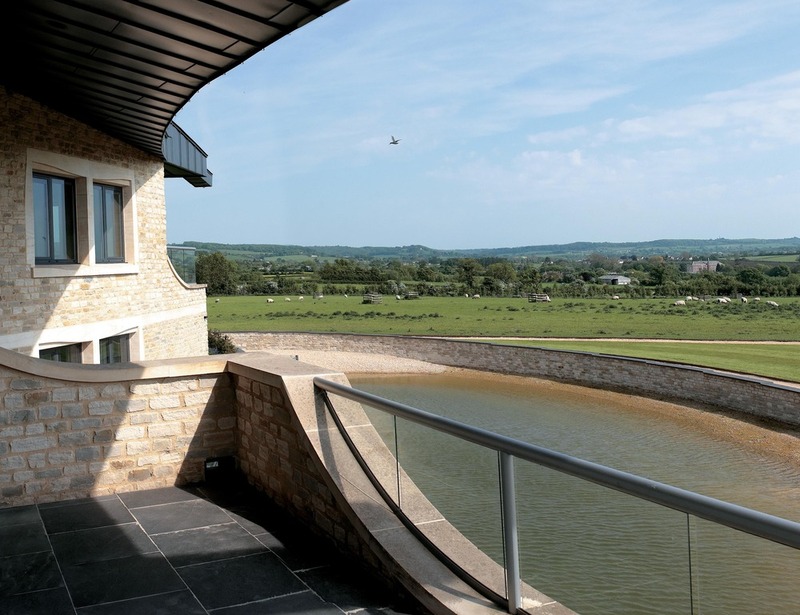 Similarly, on two high-tech properties at Swinhay House in Gloucestershire, more than 45 metres of curved and straight glass balustrading panels met the complex design and aesthetic requirements – with spectacular results. All the balconies were highly unusual shapes in combinations of convex curves, slopes and cut out of stone to follow the building’s unique shapes and changing levels. Not one balcony had a 90 degree corner in it. Irregular geometric shapes and sharp angles were also a key feature of a 22-metre glass balcony overlooking the Atlantic Ocean in Cornwall. Specified to keep the sea views and resist corrosion, the glass panels provide additional protection on windy days.